Rewriting The Book - What if Eric Young beat Robert Roode at Slammiversary '07? (Part I) - WrestleCrap - The Very Worst of Pro Wrestling! In the six-sided ring, the dark man in the white trunks stands over the blond in the blue pants, leering. It has been a match months in the making — months of humiliation for the man now lying on his back in mid-ring; months of being, as near as makes no odds, the bondsman for the dark man. Finally, the dark man gives his slave — though none dare speak the word aloud — a single chance at Freedom; he need only defeat his master to break the contract binding them. It has been the kind of match TNA’s fans hope to see — two of the smaller, but far more nimble, men of the TNA roster, both giving their utmost to defeat the other. The audience has seen it all — traditonal locks and holds; ground-and-pound brawling; moves from the ropes which would make luchadores proud. And neither man holds an advantage — the blond misses a clothesline, and finds himself on the receiving end of a neck-breaker; the dark man attempts a stomp from the top rope, and gets a foot in his face for his trouble; a suicide dive from the blond connects, but earns him a trip to the safety rail ringside; the dark man’s attempt at a chinlock submission sees the blond not only break the hold, but lift the dark man to his shoulders and execute a suplex. More surprising is that the blond is outnumbered — the dark man has an equally-dark woman at ringside, to lend moral support… and the odd bit of fire support. But even this has been insufficient; at one point, the blond has both the dark man and the dark woman on his shoulders, and both get dropped on their heads! All this, and the match but six minutes old. In the end, it comes down to the dark man’s preferred weapon — treachery. While on the floor next to the ring, the dark man’s hair is grabbed by the blond. It is the signal the dark man has been waiting for; he swings ’round, the folding chair he’s been concealing rising up to connect with the blond’s unprotected head. The blond staggers backward to the ring’s center, then collapses, laid out like a corpse at a funeral. The dark man swaggers into the ring, sweating, bruised, but smirking as ever. Rather than make the pin immediately, he moves to stand over his fallen foe, to savor the moment, to gloat. It is a mistake he will not have time to recognize or recover from. The blond’s booted foot swiftly rises, slamming into the dark man’s groin. The impact launches the dark man forward; he crumples to the mat, curled like a pillbug. Before the dark man even hits the mat, the blond is moving — rolling sideways onto his stomach, then springing forward onto the curled-up foe. Between the pain of the low-blow, and the blond’s positioning, the roll-up pin is solid — there will be no escape. Once falls the ref’s hand; then twice; then a third; the crowd counting aloud along with the slaps to the mat. When the referee springs to his feet and points to the bellman, the audience roars their approval… it is the result they have been hoping for. The blond dives from the ring’once on the floor, he leans against the railing, while the audience members who can reach pat his shoulders, and the rest cheer and chant the blond’s name. IMPACT! retuns from its first commercial to the door of Jim Cornette’s office. Ms. Brooks stands outside the door, looking nervous — and well she might, for the voices audible inside the office are not happy; and one of the voices is her boss, Robert Roode. The ensuing silence is palpable. Then Roode appears in the doorway, and his expression is not one anyone would wish turned upon him… or her. Unfortunately, Ms. Brooks does still have a contract with Roode; and it is her upon whom Roode’s angry glare falls. He pauses but a moment, then begins stomping down the hall. “SHUT UP!” Roode roars. “I don’t need excuses out of you! I need you to do what you’re told to do — what you’re paid to do! I can always find another manager; your kind are a dime a dozen! Now come on — we have to get ready!” Roode again snap-pivots, and stomps away; Ms. Brooks follows after a moment, her face a stunned mask. And hers is not the only stunned expression — this exchange has occurred in a very public space, in full view of wrestlers and backstage crew. Most see and hear, and quickly turn their faces away, trying to ignore what they have seen and heard. A few, like Samoa Joe and Gail Kim, look disgusted, but then shake their heads and go about their business. One man stares longer than the rest, and his expression is not shock, but horror — Eric Young has realized what his victory means for Ms. Brooks. Young has a more-immediate concern that night, however — he faces James Storm, who is no slouch even with a beer bottle welded to his hand; and Storm has Jackie Moore in his corner to run interference. The match is short — a hair over five minutes — but brutal; Storm gets in the first major hits, connecting with a series of chops, then an enzuigiri. While Young is dazed, Storm whips out some of his favorite moves — the sling blade, both of his double-knee breakers (face and back). But then Storm gets cocky, taking time to mock the audience’s boos, slowing his offense. When he fires Young into a corner of the six-sided ring, to set him up for a spear, Young does not seem to hit the corner with much force, though he does not move from the corner — not, that is, until Storm is committed to the spear; then Young drops down and rolls out, and Storm hits nothing but corner post and turnbuckle. Young does not give him time to recover — a vicious series of forearm smashes and elbows leaves Storm reeling, dazed. Remembering Moore’s presence, Young never allows Storm to approach the ropes again, but instead doubles him up with a superkick to the midriff; then finishes him off with a Death Valley driver. Young celebrates with the crowd, as he usually does, but his expression suggests his mind is somewhere else — or perhaps sometime else…. When Robert Roode appears for his match with Rhino later that evening, his expression is as dark as ever; and Ms. Brooks walks well behind him, almost cringing. Rhino takes in the tableau, and his normally-angry features darken further. With two men in such moods, the match only barely resembles wrestling — Roode and Rhino openly trade closed-hand shots and low-blows, and spend little time actually in the ring, pinballing off the safety rails. The steps to the ring are used early, and often. It appears after a few minutes that Roode is getting the upper hand; but then Rhino is able to reverse a hold and turn it into a fireman’s carry cutter on the apron, followed by rolling Roode into the ring, and hitting a series of belly-to-belly suplexes. Ms. Brooks sees this, and takes a step toward the ring — and finds her path blocked. Eric Young has appeared from the crowd; he stands between her and the ring — and Roode. His face seems pale, even more so than usual. Their gazes meet… and Young very slowly shakes his head. Ms. Brooks hesitates, seemingly unsure of what to do… and this hesitation seals Roode’s fate. With no interference, Rhino is able to set up Roode for a Gore, followed by a spike piledriver; the three-count is academic. Before he leaves the arena, Rhino pauses to glare at Roode, then spits at him. Young hears the bell, sees Roode lying vanquished, and vaults the safety rail, vanishing back into the crowd as fast as he’d appeared. Roode looks up from the canvas, and sees only Ms. Brooks looking on in shock. If his expression was dark before, now it is almost completely black… and it is aimed squarely at his manager…. It is the day of Jim Cornette’s Big TV Match — a “Triple Threat” between current champion Kurt Angle, his nemesis Christian Cage, and audience favorite Rhino. With the existing tension between Angle and Cage, coupled to the “no-DQ” rules of the Triple Threat match, the audience expects an outright brawl, and blood on the mat. They get what they expect — but not in the way they expect…. One of the lead-up segments prior to the match (the only one on the card!) sees Cage and Robert Roode walking down a hall, speaking in muted tones. Visible behind them, but keeping her distance, is Ms. Brooks. Cage smiles back. “We’ll call tonight a probationary run — you pass, you’re in.” He offers his hand to Roode, who shakes it firmly. “You won’t regret this,” says Roode, as Cage wanders off-camera. No sooner is Cage out-of-frame than Roode rounds on Brooks. Roode walks off-camera; after a moment, a cowed Ms. Brooks follows. In the shadows at the end of the hall, a figure can be seen observing — a figure with blond hair…. The Triple Threat title match takes up most of the show, with Rhino dominating the early rounds, until Angle and Cage strike a temporary alliance to beat The War Machine down. Cage then slips away, letting Angle and Rhino soften each other up; only when a pin seems imminent does Cage reappear. Then Angle bails, letting Rhino have his way with Cage. Then Angle and Cage finally face off. Then it’s Rhino and Cage against Angle — the cycle of alliances and betrayals seems a microcosm of wrestling writ in the ring. And “betrayal” in this case is spelled “run-in” — first Abyss appears ringside to attack Cage; then Cage’s associates Tomko and A.J. Styles strike Abyss from behind; then Sting arrives with baseball bat in hand to take out Cage and his cronies; then Robert Roode arrives to help Cage. (Ms. Brooks keeps her distance, clearly realizing what will happen to her if she gets involved.) Pandemonium ensues, with various wrestlers knocking the seven bells out of each other, and the various faction heads directing traffic. In the confusion, no one notices the blond man with the folding chair flow over the safety rail. No one notices him glide up to Cage. No one sees him raise the chair, and gently poke Cage in the back with it. Cage whips around at the touch — and is blasted dead in the face with the folding chair, dropping him to the ring-apron padding, knocked colder than a wet mackeral. The impact of the chair reverberates around the arena. All the fighter suddenly stop, and focus on the source of the sound. Most are surprised — but Robert Roode is clearly horrified. Young surveys the scene. None of the combatants takes a step closer to him; in fact, those closest back up. Young finds Roode… and simply smiles mirthlessly. Then, as quickly and as silently as he arrived, he vaults the rail and vanishes into the now-roaring audience. Roode sprints to where Young went over, but is blocked by jeering audience members. Roode then rushes to Cage’s side, but Cage is o-u-t OUT. Angle’s Olympic Slam on Rhino to end the match passes almost unnoticed. The final shot of the episode is focused on Angle celebrating his retention of the title — but just visible in the foreground is Roode, jaw dangling, staring down at an unconscious, and title-less, Christian Cage…. After an opening recap of the previous week’s match, and another Triple Threat match (this time for the Tag Team Title belts), we see Robert Roode and Ms. Brooks walking down a hallway; his expression is a mix of anger, and nervousness. 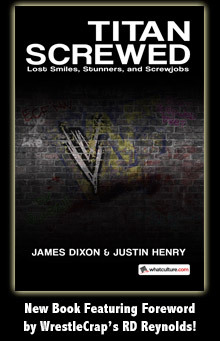 And well he might be nervous, for he is brought up short by Christian Cage, A. J. Styles, and Tomko. Cage sticks a finger in Roode’s face. “Maybe — but he clearly isn’t done with you.” Each emphasised word comes complete with a fingerpoke to the chest. “Now you listen, wiseass: Unless, and until, you deal with this ‘little twerp’, you stay the hell out of our way. We have enough problems with Angle without you dragging what’s-his-name into all this.” Cage then looks at Styles and Tomko; the trio leave, Tomko sparing a glare Roode’s direction. “SHUT THE HELL UP!” Roode roars. “I don’t know what you and that clown are up to, but tonight, I’m going to have to teach you what it means to Fail in this business.” He then smiles; there is no humor there. “You have a match tonight — with Jackie Moore. Her man will be there for her; yours, conspicuously, won’t. See how you like being left in the lurch.” Roode turns and stalks off, leaving Ms. Brooks almost in tears. The match between Brooks and Moore is mercifully brief — too rattled to put up a fight, Brooks is rapidly beaten down and pinned. Moore then calls for James Storm’s signature beer-bottle; Storm rears back to toss it to her — and is blindsided by a folding chair wielded by Eric Young, who has come down the ramp with all the subtlety of a semi with no brakes. Oddly, following him is Gail Kim; Kim makes for the ring, and the downed Brooks, causing Moore to abandon the ring. Young then smashes the bottle over Storm’s head; Storm, bleary and lying on the ground, sees Young standing over him, and hears the fan-favorite shout “THINK IT OVER!” Storm promptly staggers up the ramp as fast as he can manage; Moore follows, not sure what’s going on but wanting no part of it. Young looks to Kim; Kim checks on Brooks, then nods. Young then heads for the crowd, and vanishes over the railing, while Kim assists the medical team in helping Brooks to the back. True to his word, for once, Roode is nowhere to be found. Samoa Joe makes his way to the ring, his expression suggesting he’s about to wrestle ten pounds of fresh excrement in a five-pound bag in a well-used litterbox… or perhaps he’d prefer to rather than be in the same ring as Roode. Whichever is the case, the bell’s ring heralds a most-impressive match — Roode’s behavior towards Ms. Brooks may be appalling, but he is still a skilled wrestler, and a crafty one. Rather than engage Joe head-on, Roode uses “shoot and scoot” tactics, bouncing in to take shots at loaded knees or exposed eyes, then backing off before Joe can retaliate. Brooks, however, merely looks up. In the crowd, Eric Young has appeared. He says nothing, but merely watches Brooks. Roode looks stunned, then repeats his orders. Brooks finally responds… but very slowly. Too slowly; Joe recovers, and his rage is obvious to all. Roode is grabbed from behind, thrown bodily into a corner, repeatedly forearm-smashed, and then is the recipient of no less than four suplexes. The three-count is almost an afterthought. Brooks takes one look at the ring, sees Joe staring at her — and flees. Young has already vanished into the crowd…. Almost buried in the mid-card is a Women’s match — it is the ringside support which draws this match more than its share of attention. Announced as “Gail Kim vs. Ms. Brooks”, the crowd is shocked at the manner in which Roode brings Brooks to the ring; he is practically dragging her by the wrist, and the words he says to her can only be said on Pay-Per-View. Roode tossing Brooks into the ring seems a mistake for him; the moment Brooks is clear of him, a veritable tsunami of garbage washes over him, including a perfectly-aimed large cup filled with soda which nails him dead on the side of his head. The audience also says words which cannot be repeated anywhere except PPV. Ringside Security looks decidedly nervous. Then Kim appears, and the positive reaction from the audience is not just for her, but for the man standing behind her — Eric Young. They come down to the ring, Young looking and acting every inch the bodyguard, a foil to Roode’s presence. The match is perhaps five minutes, but most of it is Kim on the offensive — and the rest is Roode being offensive, berating Brooks every time she gets away from Kim, showing no inclination to help her. Roode’s behavior attracts unwanted attention, however; Young circles around the apron, his eyes fixed on Roode, his expression one suggesting deep thoughts on the frailties of the human condition. Roode determines Young is the greater concern — or at least that Brooks is unworthy of his aid; soon the pair of them are exchanging blows on the apron, and bouncing each other off the safety rail. Even the announce table is not spared; Mike Tenay and Don West are sent scrambling as Roode and Young brawl. And it is here that Young pulls his trump card, smashing one of the announcer’s chairs into Roode’s face, dropping Roode like a rock. Young’s removal of Roode from the picture does not help Brooks, though; Kim finishes her off with her trademark tilt-a-whirl headscissors armbar. Young comes to the ring and escorts Kim to the back, but not before kneeling next to Brooks, and saying something which the cameras cannot pick up. As they pass the unconscious form of Roode, they look his way; Kim’s expression is one of contempt, Young only smiles…. 4 Responses to "Rewriting The Book – What if Eric Young beat Robert Roode at Slammiversary ’07? (Part I)"
This was a good first attempt. I do like your writing style. There are two big factors I’m having a bit of trouble with though. The first is that you haven’t made it accessible to people who weren’t watching at the time. Roode comes up to Cage and asks to be part of his group. Who is in his group, and what are their goals? You need to set the scene for us, because a lot of people weren’t watching TNA in 2007. I would have included a scene-setter at the beginning of the chapter, just so we knew who the players were that were involved. The other thing is that you have some of these players going in and out of the main story, but we don’t find out what happened to them when the entered this storyline. Clearly a loss by Cage to Angle had ramifications, what are those ramifications? I agree with BeaverCleavage here. I for one don’t even know what the stakes of the Young/Roode match were. Was it if Young lost, he’d be fired? I only vaguely remember the Roode/Young feud, so it’s hard for me to invest when I don’t know what’s happening or why it’s happening. That said, I think this is a solid beginning to the story and I am interested in reading part 2. Accessibility is always a problem with TNA — it’s never been big enough for a large audience to be familiar with it. That said: Reread the 28 June section; it has the relevant plot-arc details. I don’t get this title. Eric Young did beat Bobby Roode at Slammiversary in real life didn’t he?